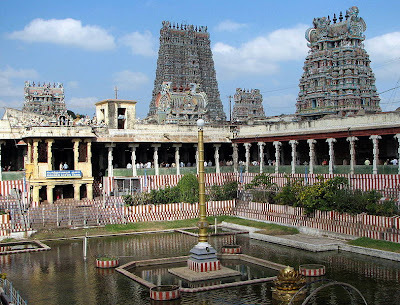 Our unanimous selection for this year’s vacation (2011) was Madurai in Tamilnadu; out of four days available; we allocated first day for Madurai Meenakshi Temple; second day for the surrounding locations of Madurai like Thirupparam-kundram, Thirumalai Naicken Palace, Alagar Temple etc. The third day was for visiting Rameswaram (the tiny island off eastern mainland that houses one of the oldest temples in India). The first and half of the fourth day allotted for the grand temple turned out to be utterly insufficient; the temple turned out to be far more than what we could perceive! Madhura (Madurai); this city is indebted to its origin, growth as well as existence to this grand temple by name Madurai Meenakshi Sundaresanar Temple. The architectural marvels known as gopurams (towers or spires) are so awe- inspiring that their images will never fade from one’s mind. Those richly carved spires with innumerable images, thousands of exclusively carved sand-stone pillars built by unknown artists, countless number of idols made in black and other rare granites; the golden lotus pond, etc are something words can never convey. Here in Madurai all streets lead to the Temple; they are the haven of many small venders (mainly women) doing brisk business selling flowers and the entire streets are filled with the fragrance of those beautiful flowers stocked for devotees’ needs. Coconuts, fruits like guava, mango, cucumber etc (the prices they quote are very reasonable unlike other tourist- places). Devotees buy flowers and fruits to be offered before the deity as per the custom and these are the main items sold by these women who scrambling for client’s attention. 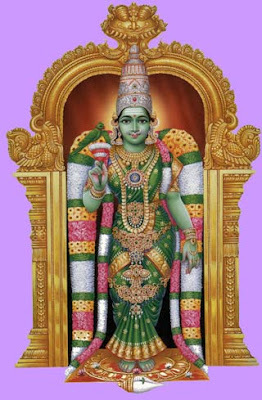 Meenakshi is the Tamil version of Parvathy; meaning the woman with fish shaped eyes. I had a notion that the temple was of Meenakshi; some Tamil deity; however this visit proved how wrong I was; and it changed my whole concept about Hindu temples and their sculptural values; the tough and brittle sand stones, marble or granites were mere wax-blocks before those gurus. The original structure of this temple is supposed to be 2500 years old which had undergone several reconstructions and modifications by Chera and Pandya dynasties who ruled this land for several centuries. The main deities are of Lord Shiva and Goddess Parvathi (Meenakshi). Entry to this temple is through the eastern gate first structure is of Ashta-Lakshmi Mandapam (where eight beautiful idols of Goddess Lakshmi are carved). After that it is Meenakshi Naicken Mandapam that is endowed with carved sand-stone pillars each exquisite piece a feast to the eye. Ayiram-kal mandapam or the thousand pillared tower is so rich to behold admission by paying a fees of Rs 10 is a must see place. The beautiful and priceless statues and murals exhibited really great in fact one full day are required to watch these exhibits. Never forget to keep the camera though rules demand some fee for taking in camera. 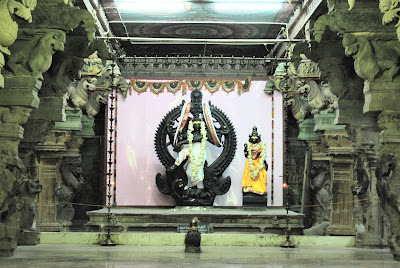 Sanctum Sanctorum (Sree-Kovil) for Shiva and Meenakshi are separate it is customary to pay obeisance to Meenakshi first (women first is no strange thing to old culture). Ganapathi (the son of the couple) is seated between the couple; Lord Shiva (a ten feet high statue) seems to be contending with coming third place as per the temple’s protocol; a smile in his face definitely declares that! 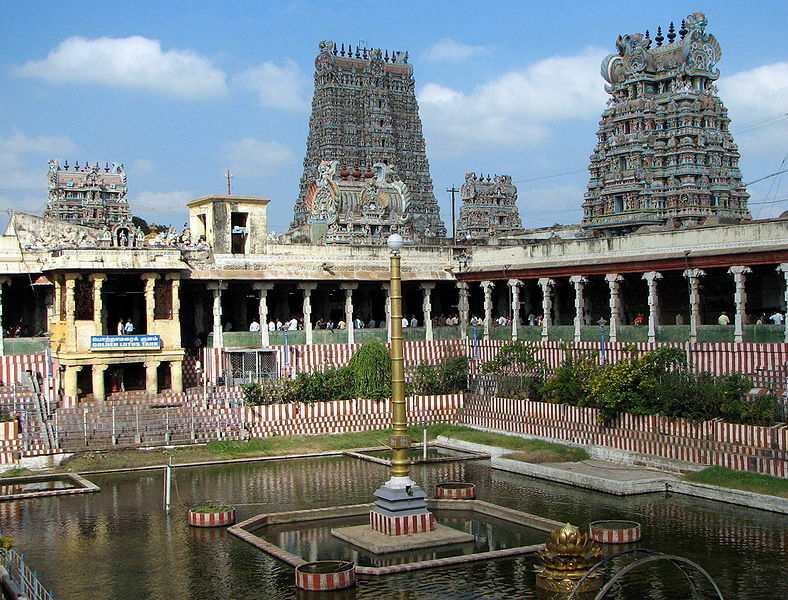 Meenakshi Temple is the symbol of love and its fulfillment and marriages held at this temple are considered auspicious that lead to long and fruitful married life. The venders here trade the sacred thread and mangalya- sutra (used to tie knots in marriage) as there are many to buy it from Madurai itself for the blessed presence of Holy Meenakshi! Located at the heart of the city of Madurai; this temple is accessible by train, road and air; good lodges are available for reasonable rates (the air-conditioned double room we stayed cost Rs.2050 a day). Services and cleanliness were satisfactory and location was close by the temple enabling frequent journey between temple and room by walking. A small though bit crowded vegetarian restaurant nearby (Sabari’s) served excellent vegetarian delicacies was a real boon. Thirupparan-kundram -we visited on the second day- is a grand temple with exclusive sand-stone carvings and nearby standing bare-rock on extreme proportions is real thing. I recommend visitors to Madurai should visit this temple at any cost. A deep pond in the temple compound that never dries up (Tamilnadu is a place where water is scarce) and the huge decorated chariot with its coir ropes (used for tugging it during festival rituals) are all unforgettable sights. Lack of maintenance and migration of beggars have sullied the otherwise beautiful spire in front of the temple. Palace of former king Thirumalai –Naicken (who ruled Tamilnadu during 17th century) which is notable for its huge pillars, golden throne (on which the king sat to oversee the court), art works on its high ceilings etc were impressive. Alagar Hill and nearby Vishnu Temple (Kovil) and innumerable monkeys those lived from the food materials given by devotees etc were on our menu which were left for the second day. Our third day was to visit Rameswaram the grand temple that houses many theerthams (wells containing pure water considered holy); there is train from Madurai to Rameswaram that pass via Tirunelveli and reach the sea-island over the Pampan Bridge (this bridge in itself is a marvel as train and road bridge pass parallel across the sea for kilometers). Many years back a bridge along with a train full of passengers were washed away by the sea causing several deaths; that memory will haunt the present passengers while the bridge is crossed! Rameswaram also has many sights other than the calm sea and the famous temple. It was sad to see the grand temple was infested by toots never eligible to handle traditional rituals. However a restaurant operated by a Jain Association here serves excellent and fresh vegetarian food at reasonable cost. They also offer a very simple and tidy accommodation. Our fourth day was of preparation for return yet a visit to Meenakshi could be possible; Meenakshi was more beautiful even for the second sight. The venders who have vandalized inside the temple seemed to be pity and we felt enraged to the government policy which gave license to this type of desecration of a holy place. It was time bid farewell to Madurai as train was scheduled to depart; Goodbye Madurai. The images you used are simply awesome. Just brilliant. Really nice post. Very well written. Thanks for sharing it.